The design behind this common pump type. A. A centrifugal pump is a type of rotodynamic pump that uses bladed impellers with essentially a radial outlet to transfer rotational mechanical energy to the fluid primarily by increasing the fluid kinetic energy (angular momentum) and increasing potential energy (static pressure). Kinetic energy is then converted into usable pressure energy in the discharge collector. A cross section view of a centrifugal pump would show the use of a rotating impeller to add energy to the pumped liquid. The liquid enters the impeller axially at a smaller diameter, called the impeller eye, and progresses radially between the vanes until it exits at the outside diameter. As the liquid leaves the impeller, it is collected in a pressure container casing. 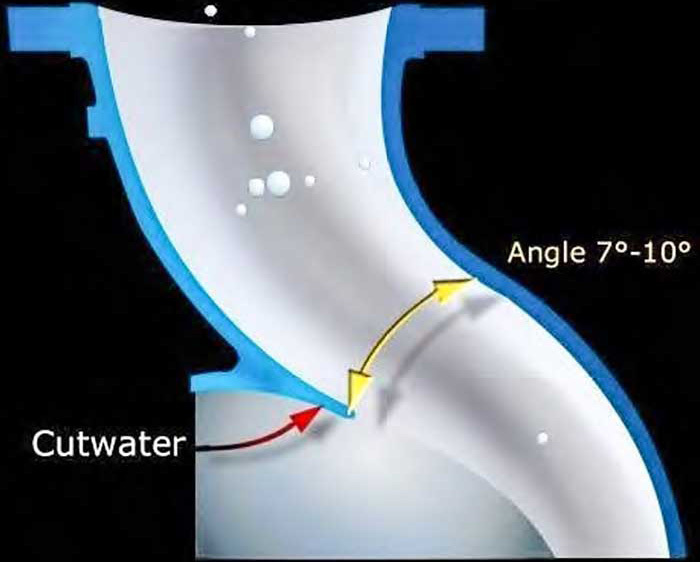 One design, referred to as a volute, collects the flow and efficiently directs it to a discharge nozzle. Image 1 highlights the discharge nozzle, which is shaped like a cone so that the high-velocity flow from the impeller is gradually reduced. This cone-shaped discharge nozzle is also called a diffuser. During the reduction in velocity in the diffuser, energy in the flow is converted to pressure energy. An optimum angle of seven to 10 degrees is used to most efficiently convert velocity energy to pressure energy. Centrifugal pumps can have many drivers, but the most common is the electric motor. The motor provides the mechanical energy to pump shaft through a coupling. The radial and axial loads are carried by pump and/or motor bearings. Sealing the pumped fluid can be done with compression packing or mechanical seals. Additionally, sealless designs are available with canned motors or magnetic drive couplings. For more information on centrifugal pumps, their construction and typical industries served, refer to the Rotodynamic Pump Certificate training modules at www.pumps.org. HI Pump FAQs® is produced by the Hydraulic Institute as a service to pump users, contractors, distributors, reps and OEMs. For more information, visit pumps.org.